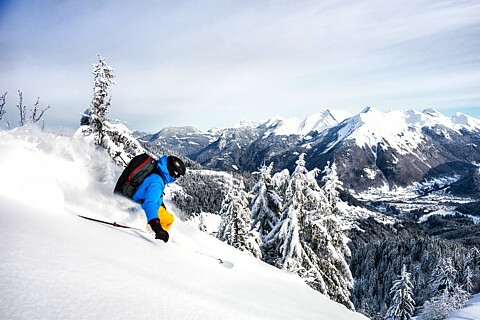 The Portes du Soleil ski area lends itself exceptionally well to beginners, but certainly also to the more advanced freerider. Just off the lifts, there are already beautiful lines to ride, and if you aren’t afraid of a bit of hiking or cross-country skiing, a whole world of virgin powder snow will open up for you. In January of each year, in cooperation with Epique, we organize a Freeride week in the Portes du Soleil. For both skiers and snowboarders, we spend a week focusing on technique, safety, choice of route and group dynamics. But we also discuss how you can already start planning at home by reading an avalanche bulletin and checking the weather reports. You can find more information on the Epique website. For experienced freeriders and cross-country skiers, you can check all of the local lines on the Chablais Grimpe website. These are mainly descents through steep couloirs and walls that you often must cross-country ski to reach. A number of the specified lines can be reached more quickly using the ski lifts. You can find more information on the Chablais Grimpe website. Skitour and CamptoCamp are two sites where there are also many lines to be found, but the latest descents and snow conditions are also posted there. Therefore, that is also useful for checking on the conditions. Of course, the preparations begin at home. Reading the avalanche bulleting is essential to ensure proper preparation for a day of freeriding. Therefore, check the Swiss and French avalanche bulletins for this region.